The fourth phase of ‘Rajasv Lok Adalat: Nyay Apke Dwar’ campaign began in Jaipur district from May 1, 2018. As a part of the campaign, revenue courts will be set up at several villages and the grievances regarding land disputes will be catered at the Gram Panchayat level. This campaign will include facilities like division accounting, marking of boundaries, registration of nominees, and making an update in the current land documents, among others. The campaign is to be organised for two months, until June 30, 2018. Rajasthan ranks second in the country for generating man-days under MGNREGA after West Bengal as per the latest data issued by the Union panchayati raj ministry. The state exceeded the target by 9% on man-days as against the revised annual target of 22 crore and generated close to 24 crore man-days in 2017-18. In a first of its kind project in the country, the state government plans to develop ‘Beti Gaurav Udyan’ (BGU) to promote the girl child in Rajasthan. The objective of developing these parks is to celebrate the birth of a girl child, maintain her dignity and to tell people about the importance of girls in the society. 25% of the park will be developed through public private partnership (PPP) mode for making it self-sustainable, while the remaining 75% area will be developed through community participation and corporate social responsibility. These parks will help increase the happiness index and encourage children to get play outdoors. In order to control law and order in the state, 13 new police circles and 28 new police stations will be launched soon. Additionally, 26 police outposts for better surveillance will be started in the coming days. Read about: Rajasthan Police: History & Organisation. The state food and civil supplies department has issued a circular facilitating ration card portability at the district level. Now a cardholder could obtain food article from any of the ration shops in the district. The Rajasthan government aims to electrify 19,000 dhanis (hamlets) and about 10 lakh rural households under rural electrification schemes by September this year. As per 2011 census, there are 43,199 inhabited villages and 1.14 lakh dhanis. Electrification has been done in all 43,199 inhabited villages, 95,000 dhanis and about 83 lakh households in the rural regions. Note: A village is said to be electrified if at least 10% households get electricity. In terms of overall electrification status, the worst districts are Dholpur at 60% and Barmer at 61% while the best districts are Sawai Madhopur at 97.62% and Jaipur at 96.55%. More than 20,000 troops of strike formations of Indian Army’s South West Command took part in the ‘Vijay Prahar’ exercise to fine-tune the jointmanship with the Indian Air Force near Suratgarh in Rajasthan. 24 sites in Rajasthan have been identified under the centre’s ‘Adopt a Heritage’ scheme which invites private and public companies, individuals and agencies to adopt the sites and provide basic and advanced amenities and look after the operations. Archaeological Survey of India has declared 100 famous monuments in the country as Adarsh monuments in which 5 are in Rajasthan. In first phase, 27 monuments have been declared as ideal monuments in the country in which Kumbhalgarh fort was included. 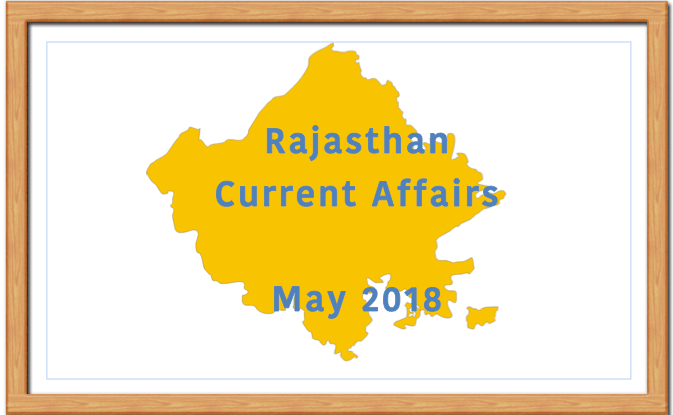 In the next phase, 73 more were added in which four are from Rajasthan including Chittorgarh, Arthuna (Baanswada), Saas Bahu (Udaipur Eklingji) temple and Ranthambore. Plans are afoot to provide basic facilities like information centre, drinking water, souvenir shop, dustbin, signage, light & sound show, toilets, etc. On the concluding day of the five-day ‘Young Directors Theatre Festival’, an immortal folk tale of Mumal-Mahendra (Ek Prem Katha) was staged at Jawahar Kala Kendra (JKK ). The play is based on a folklore of ‘Mumal Mahendra’. Mahendra is the prince of Amarkot. One day while chasing a prey, along with his brother-in-law, Hamir he arrives at Lodarva in Jaisalmer. Here Mahendra meets Mumal and falls in love with her. The 20th anniversary of Pokharan nuclear tests was celebrated as ‘Yuva Shakti evam Shaurya Diwas’ at the Shakti Sthal at Pokharan in Jaisalmer on 11th May. 20 years ago, on May 11 and 13, 1988 five nuclear explosions were carried out in the Pokharan range. On Budh Purnima, India proudly stood with the countries of nuclear power. Rajasthan Government has launched new software called Nidaan for disease monitoring and strengthening tele-medicine services in the government hospitals. The software will help for providing presumptive diagnosis and monitoring of seasonal and non-communicable diseases as well as trends of ailments found in specific areas.